Aaron Bank was born on 23 November 1902 in New York City. As a young man, Bank worked as chief life guard at an upscale resort in Biarritz, France. His widowed mother taught French and German to earn a living, which explains his unusual fluency in French and German, a skill which had much to do with his later activities as a special operations commander. 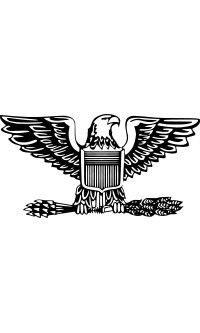 Bank enlisted in the U.S. Army in August 1942 and volunteered for special operations work. 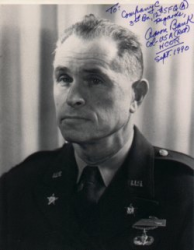 He was 39 years of age, and thought "too old" for combat, but because he was an unusually athletic man, he was accepted into the Office of Strategic Services (OSS) during World War II, as a Captain. The OSS conducted both espionage operations (SI Branch) and special operations (SO Branch), for sabotage and guerrilla warfare. Bank was assigned to SO Branch and, on 31 July 1944, led the Jedburgh Team PACKARD, parachuting into Lozère Department of France and linking up with the French Resistance. At the time of "Operation Anvil," also known as "Operation Dragoon" (the Allied invasion of Southern France approximately six weeks after the D-Day invasion at Normandy), Bank and his French partisans drove the German forces away from the beachhead ahead of the Allied troops, liberating a number of French towns before the regular forces arrived. Hitler was expected to flee from Berlin and retire to the Alpine Redoubt before the Soviets could enter the capital city, so General William Joseph "Wild Bill" Donovan, head of the OSS, issued this order: "Tell Bank to get Hitler." With the capitulation of Germany in May 1945, Bank was reassigned to the Pacific Theater of Operations, where he was inserted into Indochina and linked up with Ho Chi Minh, then leading the resistance to the Japanese. Bank spent considerable time traveling through Vietnam with Ho and was impressed with Ho's manifest popularity among the Vietnamese population. Bank advised the OSS of Ho's great popularity, recommended that Ho be allowed to form a coalition government, and predicted that Ho would win a popular election overwhelmingly if one was conducted. It is not known whether Bank's recommendations reached President Harry S. Truman, but American policy was contrary: Ho was a long-time Communist, having joined the party in the 1920s in Paris, and therefore was considered unacceptable as leader of a coalition government. Some French "Vichy" military forces remained in Indochina, and the U.S. now consented to the use of these residual forces to block Ho and reinstate Indochina as a French colony. President Truman and later President Dwight D. Eisenhower provided financial support to the French, thus leading to the Indochina War and ultimately the Vietnam War. After the war, Bank remained in the Army and became a leading advocate for the formation of a professional special forces (unconventional warfare) division, equivalent to the SO branch of OSS. Colonel Russell W. Volckmann (who had been a guerrilla in the Philippines) and Bank were instrumental in convincing the Army it needed such a force. The primary place such elements would be deployed, they thought, was behind the "Iron Curtain" in the Eastern European nations dominated by the Soviet Union, where there was a real possibility of a local resistance movement arising. In 1952, Colonel Bank became the commander of the Army's first Special Forces unit, called the 10th Special Forces Group. (This number was selected to confound the Russians with suspicions of nine more such units.) In establishing the 10th, he was as flexible as he had been with "Iron Cross," drawing upon former members of the "1st Special Service Force" known as the Devil's Brigade, as well as veterans of the OSS, the Parachute Infantry units, and guerrilla elements in the Pacific. Using the training and strategies and the lessons learned during World War II, Bank created an elite unit of men skilled in foreign languages (to interface with foreign insurgents), the arts of sabotage and stealth tactics, the use of explosives for demolition, amphibious warfare, rock climbing, jungle warfare, mountain fighting, and as ski troops. He suggested the unit should wear special berets to distinguish them from other units, but Army regulations would not allow it. President John F. Kennedy gave a special order allowing the berets and chose the color green. Today's Special Forces (also known as 'Green Berets') are still all volunteer and organized into "A-Teams," just as Aaron Bank organized his men in the 10th Special Forces group in 1952, with two experts in every specialty. They still undergo an arduous training process in which large numbers of men fail or quit, as Aaron Bank required of the men of "Operation Iron Cross." Special Forces today acknowledge the paternity of Colonel Bank with great pride. Aaron Bank retired from the Army in 1958. In 2002, the year he celebrated his 100th birthday, Colonel Bank was commended by President George W. Bush for developing the unconventional warfare programs and techniques that were used in toppling the Taliban. Aaron Bank remained a vigorous man well into his eighties, swimming several miles a day in the Pacific Ocean near his home in San Clemente, CA. Colonel Bank became alarmed at the recklessness of the civilian operators of San Onofre, and actively lobbied, then testified before a closed session of the U.S. Atomic Energy Commission, warning of the dangers of terrorist sabotage at San Onofre. As one of the world's leading experts on the sabotage of electric generating facilities, Bank spoke with great authority-but the AEC ignored him and did nothing. Colonel Bank married his wife, Catherine, in 1948 and they raised two daughters, Linda and Alexandra. Bank wrote two books, first, From OSS to Green Berets: the Birth of Special Forces, which describes his exploits in France and Indochina and his role in founding the Special Forces and then Knight's Cross, a fictionalized account of a completed Operation Iron Cross which was co-written with E. M. Nathanson. Colonel Aaron Bank died on 1 April 2004 in Dana Point, CA, at the age of 101. He is buried at Riverside National Cemetery in Riverside, CA.